What is a Vinyl Sticker and Vinyl Sticker Printing? What exactly is a vinyl sticker? What can it be used for? Read on to learn what a vinyl sticker is and what vinyl sticker printing is. Did you ever have a sticker album as a kid? Pages and pages of glittery, colourful, even holographic sticker stock was at your fingertips, and they made pretty good trade currency in the playground as well. Well, you may not be that little kid anymore, but that doesn’t mean you can’t still love stickers! And while traditional stickers are best left to the kiddos (think torn paper and sticky messes), vinyl stickers are great for grown-ups. But what exactly is a vinyl sticker, and why would you use it, anyway? Keep reading to find out more about these adhesive gems, and 7 ways they can help your blossoming business. What Is a Vinyl Sticker? Paper stickers are thin, single-use items that work well when stuck to paper and plastic, and are easy to make. The downside of paper stickers is, they’re only good for indoor use, and they can taint or damage a surface when removed. Vinyl stickers are waterproof, weatherproof and easy to clean, and they’re a great way to promote your business, too. The high-quality printing methods involved in vinyl sticker printing mean that the stickers are resistant to fading, and can be removed cleanly from a surface without leaving any residue. Vinyl sticker printing involves printing an image directly onto a sheet of vinyl plastic. The ink is absorbed into the sheet, preserving the colours and producing a bright, durable end-product. Why Use Vinyl Sticker Printing Services? Vinyl stickers are great for your business for many reasons, which we’ll discuss in a moment. Creating one is easy – just pick your image and/or text, choose your colours and you’re good to go. Send your chosen composition to your vinyl sticker printing company, and they’ll whip up and post out your stickers without further ado. But why do people love these grown-up stickers so much, and how can they help you? Check out our top 7 reasons below. Whether you’re giving away a small vinyl sticker with each customer purchase, or you’re printing a massive sticker to plaster across your company car, vinyl stickers create brand awareness. Pop your web address on there and the job’s a good’un. Because of their high quality and colour-integrity, these stickers are a great way to show off your logo and branding. And they’ll also keep your reputation intact, because they won’t fade and make your business look like a has-been, even in the hot Aussie sun. What if we told you your vinyl stickers could reach people all around the world without you having to pay an extra cent? Well, it’s true. Vinyl stickers can be used as business signage, so Google could get your brand seen all the way across the ocean in Portugal or the UK. On a nationwide scale though, vinyl stickers are visible wherever they’re stuck. Pop them on the window of your car, and people will see your brand wherever in the country you go. Slap it on a laptop, though, and the world’s your oyster. Because of their low price tag and unlimited design options, vinyl stickers make excellent gifts that won’t break your marketing budget. And they’ll bring a smile to many faces, which will certainly earn you Brownie points! You can release images that are seasonal, embrace the latest trend (Starbucks’ unicorn frappuccinos, anyone? ), and make custom stickers for specific groups within your audience, too. Starting a mini-marketing campaign with free vinyl sticker gifts is easy as pie. Just one example of a wildly popular giveaway campaign is that of Compare the Market, a British car insurance company. The company gave away free meerkat toys as part of a successful ad strategy, that has ended up running for 7 years and has a loyal following. Create the same buzz with rolling out free sticker gifts, and then making limited-edition vinyl stickers as you go. It’ll attract new clients, because who doesn’t love a gift? And your loyal existing customers won’t be able to resist collecting every last one. One of the most notable features of vinyl stickers is their incredible durability. They can withstand the harshest of weather, and remain in place from -30?C to up to a whopping 110?C. Because of this, the stickers are perfect for outdoor use and are a great way to get your brand out there and on display. Because of their incredible durability, as we said in #5, vinyl stickers are excellent for outdoor use. A great way to increase publicity is to run an advertising rewards scheme. Just ask willing customers to have a vinyl sticker adhered to their car, ute or vehicle, and pay them for the privilege of showing off this great marketing tool. The best way to draw in more customers and enhance your small business is to get your name out there. Vinyl stickers are ready and able to hit the wide open road, so why not give them the adventure and watch the money roll in. 7. Vinyl Stickers are Just… Fun! Let’s face it, like a little kid in the playground holding a prized sticker in their chubby little fist, stickers are a whole lot of fun. You can use them to breathe life and personality into your business and speak to your customers without saying a word. Connect with your audience using witty jokes, puns, and funny pictures. Or, if you want to show your ethical side, you can use cute or distinctive imagery to connect with your target market in a way like no other. 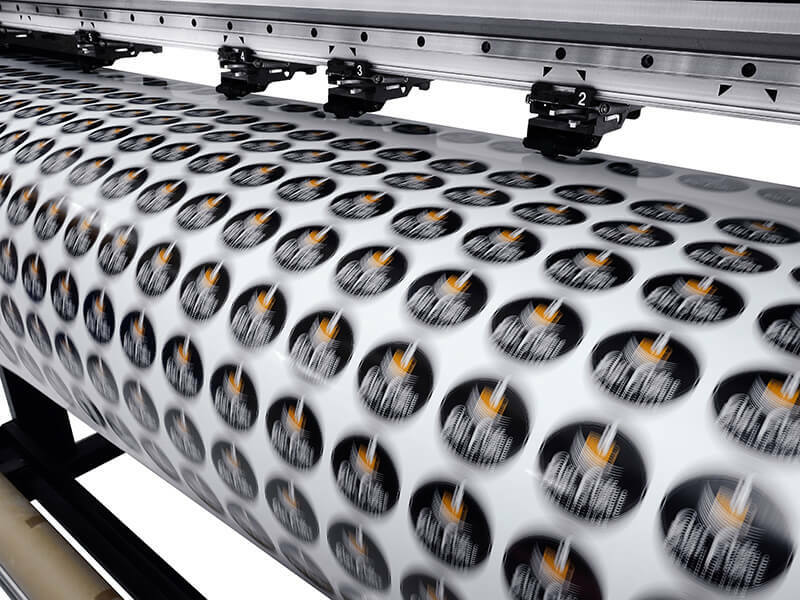 Vinyl sticker printing is an excellent tool to add to your business marketing arsenal. Custom printing allows you to set the image, style, and colours for these great little mascots, and you’ll be able to reach a much wider audience than digital marketing alone. These stickers are durable, easy to use and will stand the test of time (and weather!). And with a little creativity, you could even start a marketing trend that’ll go viral across your target customer base. Does that sound good to you? If you’re looking to up your vinyl sticker game, then contact us to get it done.